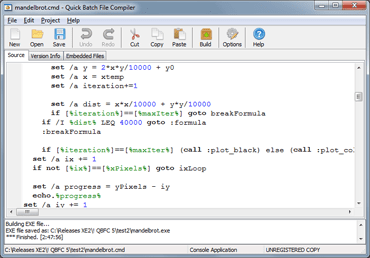 Batch File Converter turn your batch files into actual program (.EXE format) in one click. An .EXE file is much harder to casually reverse-engineer, so this could be a way to conceal a particular batch file's operations from an end user. Content of your batch file will be encrypted and protected from changes. Batch File Converter also lets you set various resources in the .EXE file, such as its description, the company name, version information and even the application icon. In additional, you may include any files to compiled exe file and use it during execution. 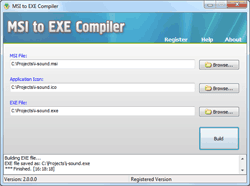 You can compile any batch file to exe format compatible with Windows XP/Vista/7/8/10. 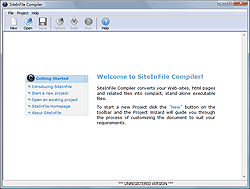 Compiled EXE file does not need libraries or DLL files. You can create unlimited products without having to pay royalties. Converter protects contents of a batch file from the non-authorized changes and hides contents of a batch file from viewing. Keep your secrets! You can distribute any additional files required by batch script inside a single EXE file. All files will be extracted to the temporary folder before main script execution and deleted on exit. In addition to creating console applications, you can also create "ghost" applications. Such application opens no windows and provides no feedback. It's a best way to perform an install or modification silently. 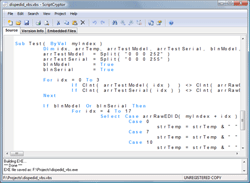 The code editor supports syntax highlighting for the built-in commands, and can open a context-sensitive help for individual commands. If necessary, you can start compiling from the command line. You can define icon image, copyright and version information for EXE file before start compilation. Batch files are programs that allow MS-DOS and Windows users to create a file to perform a long tasks fast. Such as opening certain programs ran frequently, deleting or managing files, etc. Simple batch files do not require any special programming skills and usually can be done by knowing the below commands and or just DOS commands. A prime example of a batch file for someone whom may know more about Windows would be relating a batch file to a shortcut in Windows. Batch files like a shortcuts are small file which is used to run frequently accessed programs. 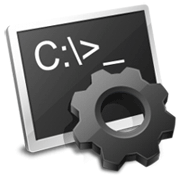 Another example of a very well known batch file is the autoexec.bat, which is simply a boot file loaded each time the computer is loaded. Within this file contains various lines to load various programs and drivers into memory each time the computer boots.